After searching around the web and forums such as Virtual Tourist, I finally made the reservation of the hotel, or rather hostel that we’re going to stay in Hong Kong. It’s EastSpider Hostel, which I booked from HostelWorld. It’s a hard decision to select the hotel to stay, as I am travelling with my parents. so it’s not advisable if the conditions and safety of the hotel is too bad. And Chungking Mansions and Mirador Mansions are notoriously cheap yet cramp, dirty and safety standard in doubt. I went to Singapore’s NATAS Travel Fair in Suntec to look for a hotel in Hong Kong. Almost none of the travel agencies and travel agents in the travel fair has the service for reservation of hotel or hostel only, except Hong Thai Travel Services. But the hotel room rates for 2 person are at least SGD $120 (about HKD $570) and above. It’s easily cost over SGD $1000 for all of us for a 3-night stays in Hong Kong (I decided to spend more time in Hong Kong rather than Macao), not including yet hotel stay in Macau, just in case we need it when arriving in Macao at 2.15 am wee-hour. Finally I found GoHostel from Air Asia, which listed some pretty cheap hostel and guesthouse accommodation in Hong Kong. 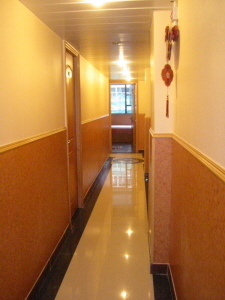 Although I am quite consent about the cleanliness of hostels in Chungking Mansions and Mirador Mansions, but the photos on the reservation websites look otherwise. And my brother advised me to book cheap hostel too, so that the money save can be used for shopping and playing. I quickly ruled out Chungking Mansions as it’s now mostly occupied by workers and visitors from Indian subcontinent and Africa. I shortlisted a few hostels such as YMCA Salisbury Hotel, Ah Shan Hostel, Dragon Hostel, Man Hing Lung Hotel, Travellers Friendship Hostel and EastSpider Hostel. Some of them is located in Sincere House in Mongkok. I selected EastSpider Hostel as it’s located at the heart of Kowloon, Tsim Sha Tsui, which I guess we’ll spend most of our time there. Beside, from the photos, it looks very much like a hotel, although I don’t expect it to be big. 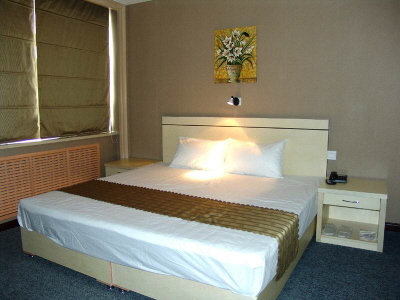 And at that point of time, EastSpider Hostel has the highest ratings and reviews in HostelWorld. 31st March 2006: Double Bed (Private Bathroom) Ensuite at 140.00 HKD per pax and 3-Bed Private Room (Private Bathroom) Ensuite at 110.00 HKD per pax. 1st April 2006: Double Bed (Private Bathroom) Ensuite at 140.00 HKD per pax and 3-Bed Private Room (Private Bathroom) Ensuite at 110.00 HKD per pax. 2nd April 2006: 3 Double Bed (Private Bathroom) Ensuite at 140.00 HKD per pax, but since it’s 3 private rooms, we have to pay the rates for 6 persons. So the total is HKD $2180.00 with additional USD $2.17 service charge. Deposit of 10% of hostel room rates need to be paid immediately, and I charged USD $31.19 to the credit card. It seemed like HostelWorld will ‘block’ the room once you selected it, but not releasing the blocked room immediately because I was allocated 3 Double Bed room at the last day of our stay due to shortage of 3-Bed Private room. But once I booked and paid, and I checked the availablity of rooms again, it became available again on the date. I also decided to skip the reservation of hotel in Macau. We’ll reach Macau at about 2.15 am according to flight schedule. But Air Asia flights are notorious for delay, so if it delays for a few hours, the hotel booking deposit will be wasted.